We know the places we know sensorially. We know what they feel-like, smell-like, sound-like, look-like and taste-like, as if they weren’t separate from our own body. We have a rich and raw relationship with these places. They have imprinted on us; perhaps we have imprinted on them as well. But either way, these places have been a part of making us, us. 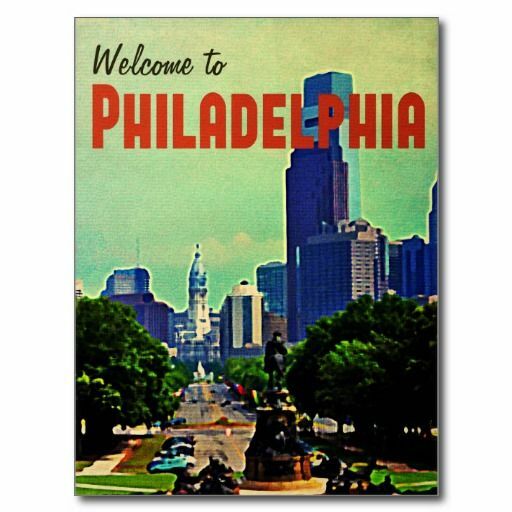 I am Chicago born, but spent the bulk of my childhood in Philadelphia. I returned to this city of my birth for college where I have lived for the past four decades. I’ve spent a lifetime back and forthing between the east coast and the Midwest. Last month I was in Philadelphia for the first time in years. Somehow five years had flown by – the longest time I’ve ever been between soft pretzels and a Philly cheese steak. As I drove around the city and then into the suburbs visiting family and friends, the skin of my hometown city reached out and touched me again: the narrow wind of the roads, the extreme tilt of the terrain, the density of the tree line. It felt sweet to be back on Philly’s twisty streets, rolling hills and dells, especially in early spring. There was such beauty in the variance of its landscape. But a thought crossed my mind: You can only see what’s right in front of you at the time. Compared to the long view in Chicago, where from the window of an airplane you see an actual grid of the city just like a paper map. Where you can stand by a window in any skyscraper and see for miles to Indiana, even Wisconsin. Where you can bike for miles on long stretches of smooth level planes without breaking a sweat with uninterrupted thoughts. I took note of this because I am writing a memoir in which the central action takes place in these two very different cities. It’s got me thinking about how place stimulates us. How place is a character in our lives, pushing us in one direction or another. And I began to wonder about place’s impact on me as a writer. It’s better than falling on the ice! I was clearly a deep devotee of Dr. Seuss. 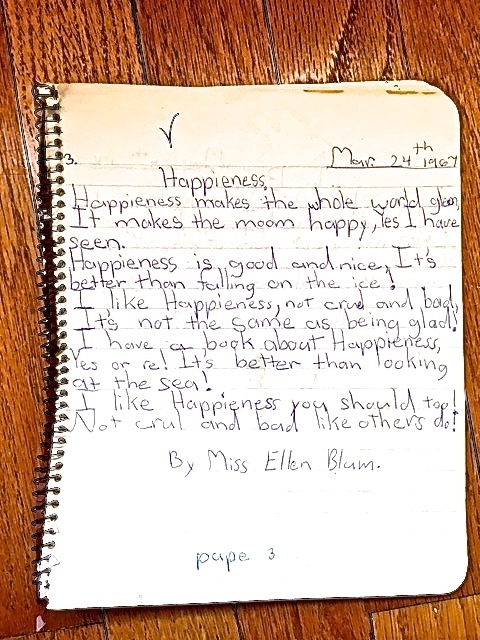 The ditties that followed, each signed “By Miss Ellen Blum,” featured imaginary kittens, birds and bunnies, friends who look like hens, toys, a car, my school, a pencil, an unidentified pet, my bed, a bay, a clock, the month of March, and then, my mother, my father, my grandparents, the sky and the outside world. Writing wise, I didn’t get much farther than that ringed notebook. There were school assignments of course, and a handful of songs written on piano and guitar. But writing didn’t take hold of me until I moved away. So Philadelphia was the place where I started to write. About the things that were right in front of me. 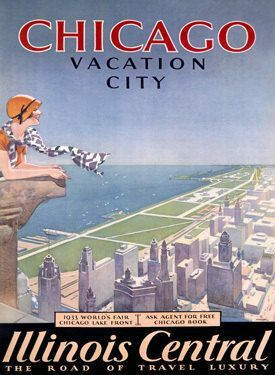 But Chicago is the place where I became a writer. The kind of writer who dives into things that are hidden below the surface. Could the wide-open spaces of the Midwest have beckoned, urging me to expose hidden ones I grew up around? Was there more room to think in Chicago? Was the beautiful rolling landscape of the east coast more like a writing obstruction rather than a writing prompt? Were there too many hidden spaces in Philadelphia? Did it not feel safe? If I hadn’t spent so many years in the City of Brotherly Love before returning to the Windy City, would I have been inclined to write at all? Was there something about the tension between these two places that set something in motion? I just know that there’s a connection between place and who we are. I just wonder how deep it goes, the impact of place to make us, us.